What is it with metallic that makes us love it so much? Is it that extra little bling? Is it the extra little something special that it adds to everyday objects? Maybe I just have a fascination with shiny objects, which could be a whole other problem entirely. grin! See how simple they are! Just a little glue, some shells and some Krylon Brushed Metallic Paint! 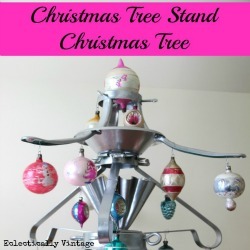 Total cost for all three trees..$13.00! 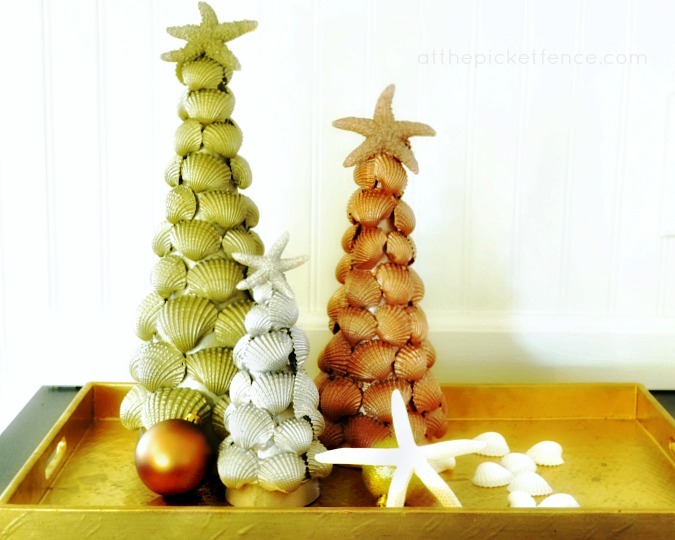 So add a little more bling to your holidays, and create your own trio of Metallic Sea Shell Christmas Trees! 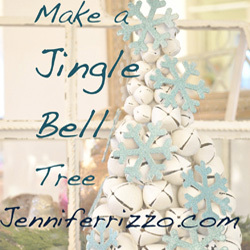 Here’s three other fabulous Krylon Holiday Project s from Beth of Unskinny Boppy, Kelly of Eclectically Vintage and Jennifer of Jennifer Rizzo. 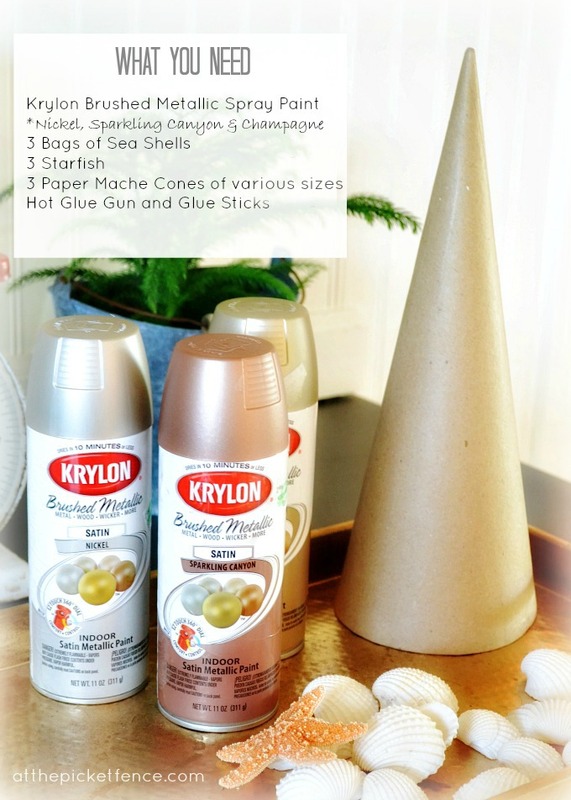 Be sure to visit the Krylon Holiday Pinterest Board for tons of fabulous spray paint inspiration. You can also get some amazing ideas by visiting Krylon’s Projects In A Can site full of projects as well as Make it Gr8 in 8, where you can share your quick 8 minute fixes using Krylon and enter to win some great prizes! It’s hard to believe we’re counting down the days so quickly to Christmas! 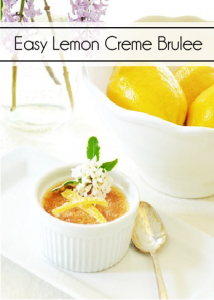 Be sure you visit often as we have many more Holiday Projects to share with you! See you back here soon…at the picket fence! 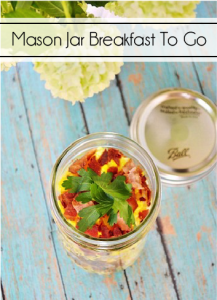 PS…don’t forget the great Miss Mustard Seed Giveaway we having going on right now! I was provided supplies and compensated by Krylon for this post..but the creative ideas are all my own! Please see our disclosure policy for more information. 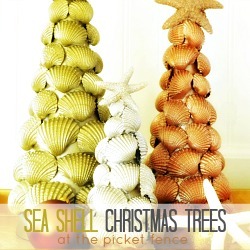 27 Comments on "Metallic Sea Shell Christmas Trees"
WOW it looks amazing! 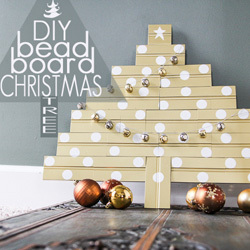 Just love metallics for christmas, and what a great way to use the shells! thank you for the inspiration and have a beautiful day! These would be a perfect addition to my mom’s back porch decor. It’s all seasidey out there. How sweet are those trees. 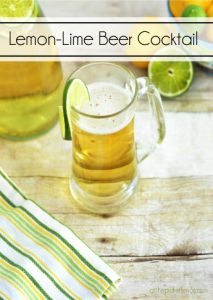 They would be perfect in nautical decor or people like me who just love the beach! How fun – now I feel like I’m sipping a pina colada while a cute pool boy is spritzing me with Evian! 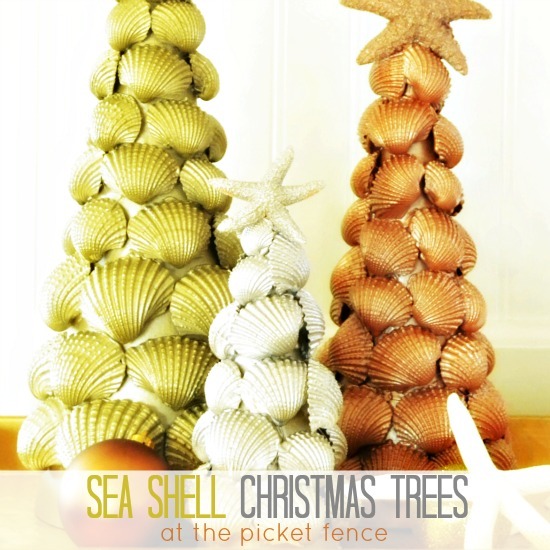 Love the starfish toppers – these trees rock (or should I say they shell)! Love the shell trees! !…Such a fantastic idea…love the colors you chose…gotta love that Krylon paint!!! What a great idea, Heather! Love that you blinged them out, too! I’m a sucker for anything seashells right now. And hey, for $13 bucks I could take my savings from Joss and Main and blow it on more rum for Kelly’s pina colada party! Great job, I love the shell trees, such a brilliant idea. Have a great day! I saw it on facebook before I made it to my blog reader. I LOVE THEM!!! They look great! Love this idea so cute!!! Thank you for sharing! 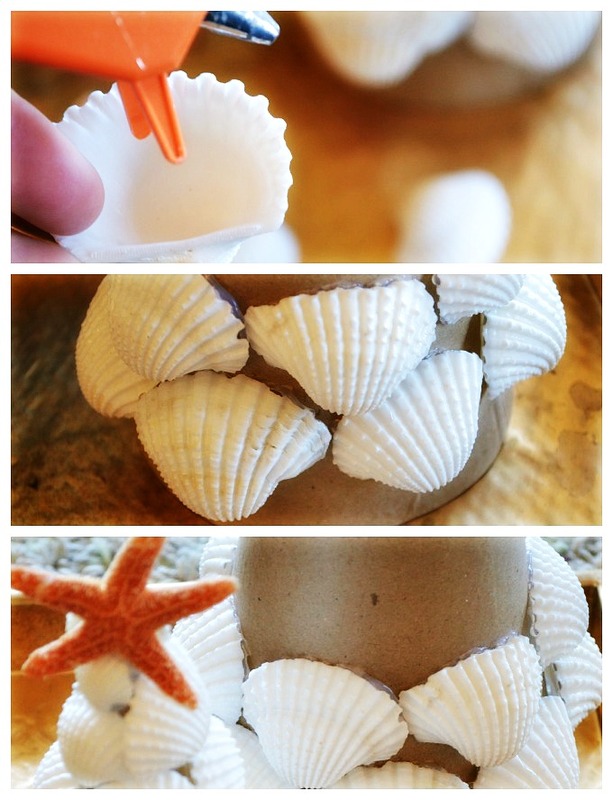 These are lovely, Now I have a new idea for all my seashells. Super cute idea! Love the colors you used and love the starfish topper! Lots of great ideas to craft next year. This Christmas is passing me by way to quickly. 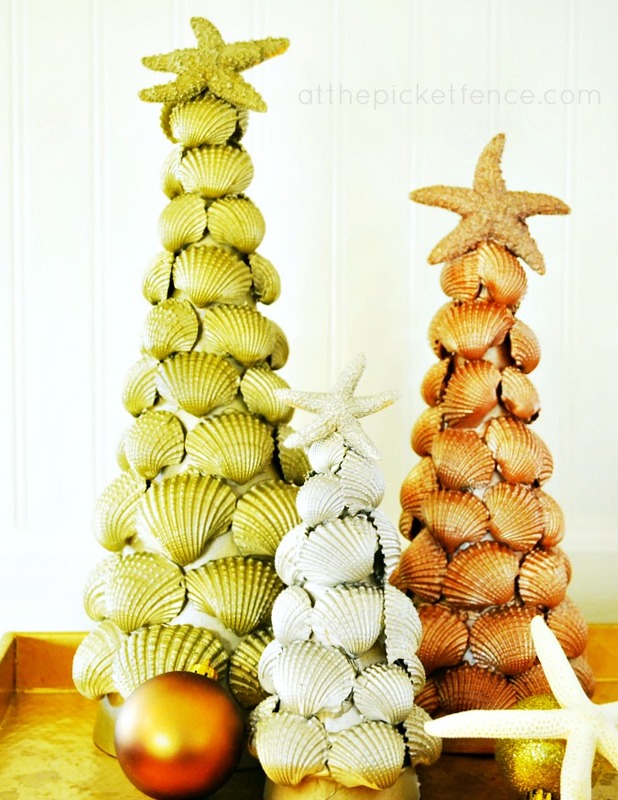 Such a cute idea for a beachy Christmas tree–love it! unintentionally, and I am shocked why this twist of fate didn’t took place earlier! I bookmarked it.